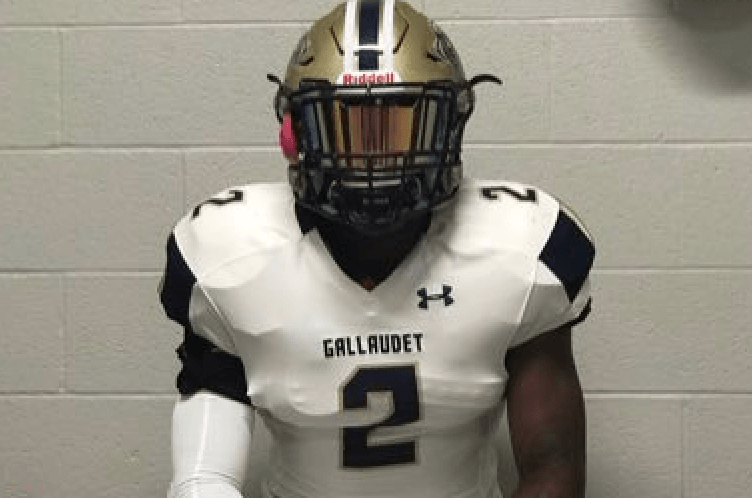 Gallaudet University defensive back Jamie Cumberbatch is looking to follow in the footsteps of former GU defensive end Adham Talaat and make an NFL roster. • My hometown is Clinton, MD and I love all the close friends and extended family I’ve made over my years living there. • Strength & conditioning, film study, & practice. I say this because footfall is a violent sport so you must make sure your body is ready for war before you step on the field. Film study is second because studying yourself/opponent before practicing can eliminate errors such as overthinking once you know what you’re up against vs going into the situation blind. Properly preparing will allow for a smoother transition into practicing essential skills & interests. • I am a firm believer in giving my worries to God so I eliminate this from my daily life on a consistent basis through prayer. • My junior year I set out to make all conference. I didn’t reach my goal but my reaction was to just grind harder and I feel as though I overcame that failure by understanding some statistics don’t always help you achieve all conference as they are overlooked. • Room because if your base of operations is a mess how can anything else get put together correctly? • I feel like my biggest adversity in life was getting injured going into my senior year of HS. I missed half my senior season and all of the division 1 schools that were interested in me stopped contacting me completely. At the end of my season I overcame it by attending a showcase and getting an offer from a division 2 school in order to continue my football career. • It would either be taking a fumble recovery 97 yards for a TD or running from hash to hash to deliver a big hit on a RB that sent him flying from the hash mark to out of bounds. • My knowledge of the game, a lot of players have the physical traits but can’t handle understanding the complexities of next level football. • Respected, because somebody can like you and still disrespect you, but if you’re respected you will not be seen as someone to be tried. • Hate to lose, that’s a feeling that sticks with you well after the clock hits 0. • I would say my father because ever since I started playing football he was there for me coaching my teams and then being there in the stands while always being one of my harshest critics. He’s kept my head on straight all these years.